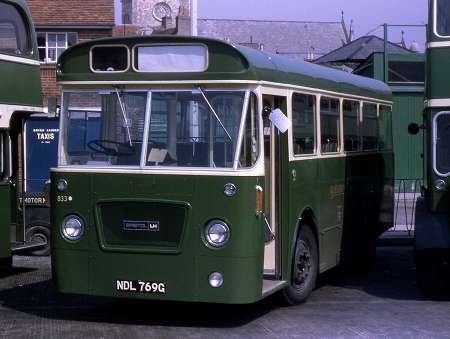 In its final years, North Western chose the Bristol RE as its standard single deck bus chassis, initially selecting the shorter RESL6G version in 1968 before turning to the longer RELL6G variety from 1969 onwards. The RESL6G saloons numbered forty in total and all came with Marshall bodywork, the first fifteen, Nos 270-284, KJA 270-284F, arriving in January 1968 as B45F. However, Nos 285-309, KJA 285-289F, KJA 290- 309G delivered from July 1968 onwards, had the reduced capacity of B43F. On 1st January 1969 SELNEC PTE was formed, and much of the North Western stage carriage network lay within the designated SELNEC area. After lengthy negotiations, the National Bus Company conceded, and the hatchet finally fell upon North Western in January 1972 when its bus fleet was dismembered, leaving NWRCC as simply a coach operator. Most of the RESL/Marshall buses, including No 282 shown above, passed to SELNEC, but Nos 302 -309 were transferred to Crosville. I am sure that our Lancastrian contributors will be able to tell me the Manchester location of the photograph which was taken in June 1970. One final question – did these buses have Gardner LW or LX engines? This is unmistakably in St. Peter’s Square in Manchester and would have to be a tram to make such a manoeuvre now! Although 281 survived long enough to get the SELNEC Cheshire fleetname as seen in the linked photo, 282 was repainted earlier as I have a picture of it in October 1970 in the above colour scheme. In your photo it seems to be newly-painted. As it’s showing "PRIVATE" it doesn’t give much clue as to why it would be there and it may well be working from Manchester to Oldham depots after having been borrowed. It is also just possible, if it is a morning photograph, that it is returning from working the solitary morning peak journey from Mottram to Manchester Lower Mosley Street that was worked by Oldham – it worked out of service from Manchester back to Oldham depot. It’s not early morning, David. At that point in my life I lived in Farnborough, Hampshire. I would catch an early train from London to undertake my Manchester transport jaunts, so it would be around midday or early afternoon. Well, at long last the NWRCC finally got its Bristols once again after more than 20 years. The Central Library in the background of the photo looks far more impressive nowadays now it has been cleaned of all the grime that had accumulated prior to the Clean Air Act. I still have fond memories of the Library: there were many Saturday afternoons I would spend valuable learning time reading Buses Illustrated and Modern Tramway. North Western received its last Bristols, ordered prior to the effect of the nationalisation of Bristol, in late 1950 these being L5Gs 311-32 EDB 311-320 with Weymann B35R bodies. The RESL6Gs were delivered from January 1968, thus the wait for new Bristols was just 17 years, not over 20. Central Library was cleaned in 1971. The photo was taken in June 1970 and the bus looks freshly repainted. Could that explain why it is where it is? Would it have been repainted in Manchester? To answer the question on engines, they had Gardner 6HLX engines. I have close personal experience of this, being the owner of the surviving member of the batch 299! For obvious reasons I’ve collected a lot of photos of this batch, and I’ve found that quite a few were repainted from the ‘more cream’ style to the one we see here when quite young. My speculation (no more than that) is that the Marshall paint job wasn’t especially good, these bodies being built down to a price, and North Western gave them a repaint in the by-then current style when only about three years old. To answer Peter Williamson’s question, it’s almost certain that it would have been repainted at the company’ Works at Charles Street in Stockport and could – conceivably – have been photographed on its way back to Oldham from the repaint. Travelling from Charles St to Oldham via St Peter’s Sq is a long way round. In 1970 the shortest route would have been Charles St-Bredbury-Denton-Ashton-Oldham. In his book Steel Wheels and Rubber Tyres, GGH says that pictures of the Bradford Panthers in original livery are hard to come by – he should have asked me. Stuart Emmet Another story on these 10 was they were bought to start OMO; however double decker OMO was approved legally soon after they were ordered, so they were redundant as far as that went. They spent their time inventing conversions to single decker routes and seemed to settle on the 61 as shown – about a 25-minute journey across town from Undercliffe to St. Enochs that went for around 5 mins over roads in the Canterbury Ave area that were not used by other routes.Effectively a peak hour route every 10 min from 0700 to 0900 and 1600 to 1800 with a few journeys between 1200 & 1400 hours that required 6 buses for the 10-minute headway. The rest of time they seemed to rest/in-filled as spares. From 1969, BCT participated in White Rose Express service X33, Bradford – Sheffield, which entered its area at Birkenshaw. The other joint operators reluctantly agreed, even though Bradford’s entitlement was no more than one journey per week! In practice, as explained to me by the late Stanley King, Bradford saved up their mileage until they were able to operate a bus for a whole week, replacing a Yorkshire Woollen duty. BCT had few single deckers and I believe these Panthers and the contemporary Swifts were used. Does anyone recall seeing a photo of a Bradford bus on X33, as I’ve never seen one. Just about everyone was caught with the change of legislation which allowed DD OMO. Sheffield certainly was – initially with purchase of the Swifts and subsequently with the change of Bristol order from REs to VRs. In the lovely book Colours of West Yorkshire the author states that these were ordered because agreement could not be reached with the Unions to operate OMO double deckers. I.e. The legislation already permitted it but not the Unions until agreement was reached later on. The Bradford manager at the time was not in favour of one man buses These and the Swifts were also used on the express X72 which ran between Bradford and Leeds at peak hours. I recall someone (who I believe was very knowledgeable) telling me that as late as 1981/2 that Bradford area buses of West Yorkshire PTE were around 80% crew operated. The change in legislation to permit double deck OPO was in 1966, and I doubt that an order for vehicles to be delivered in 1969 had been placed before that date – i.e. the fact that D/D OPO was possible would have been known. I like to see a clear and readable destination display, but in this case I suspect that a slightly smaller window would have fitted the lines of the vehicle rather better! Another story was that the unions rejected the DD legislation but SD would be OK It was also said on delivery of these SD’s unions OKed the use of DD OMO How far this any of this is fact or fiction seems lost in time. I started working at Bradford City Transport in the Traffic Office in October 1973. The story of OMO at BCT is intriguing. I cannot comment on the position of General Manager Edward Deakin in relation to OMO, although I could find out as Bob Tidswell his PA is still heal and hearty. I can say that Traffic Superintendent John Hill was not very enthusiastic about OMO, and from all accounts the T&GWU branch was not very keen, either. Around 1971 or 1972 the position of Asst. Traffic Superintendent became vacant and Brian Eastwood, who was Traffic Superintendent at Maidstone Corporation, was appointed to the post. Maidstone had undertaken extensive conversion to OMO and BCT felt that Brian’s experience in this regard would be extremely useful. Many years later Brian told me that when he arrived at Forster Square – BCT Head Office – there was little enthusiasm for OMO. Earlier this year I had lunch with Brian and he said that many of the new ideas that he tried to bring to Bradford fell on stony ground. Maidstone had a very large circle OMO sign on the front of their Atlanteans and Brian arranged for one of the signs to be sent to Bradford for evaluation. John Hill rejected the idea. Bob Tidswell once told me that Edward Deakin had a policy of splitting chassis orders between manufacturers – and thus having small batches – on the basis that if one chassis type developed a serious fault then the impact on the operational fleet would be minimised. Some of the single-deckers were allocated to Ludlam Steet and were used on the 272 service to Leeds, the 61 and sometimes other routes operated from the depot, such as Eccleshill, Fagley and Haworth Road. They were used on the White Rose service and at weekends for private hire work at weddings etc. When the PTE was formed John Hill became Metro Bradford District Manager and the position of District Traffic Officer was given to Bert Henry from Leeds City Transport who was very keen to expand OMO across the Bradford route network. BCT ordered the Swifts and Panthers (503-512 ) to start OMO and had the unions OK 8 and 10/1969. The Swifts and Panthers arrived but went to work with conductors on 61, 83 and 27-29/32. Cannot find a reason why they were not used for OMO. These buses were also available for breakdown cover for the other operators on the joint with 7 other operators "White Rose" express to Sheffield; BCT having only one journey a week which they "banked" so they could then a bus operate all week. Mr King notes the SD were already "white elephants", as by now DD OMO was acceptable, so seventy 33 foot DD were ordered, with union acceptance of OMO for these 2 door 33 foot vehicles. The DD start to arrive (401-470) but unions said no as are too long and the drivers’ view of exit door was insufficient. So OMO introduction postponed once again. This appears is a strange story, that however, shows the management/union environment at the time. Re Kevin Heys comments. There was a regular evening trip on service 46 to Buttershaw. OMP operation commenced in Bradford with the conversion of the 72/78 services between Bradford and Leeds which were jointly operated with Leeds City Transport. This started in late May 1973. I cannot recall them being used on White Rose services during my time in Bradford in 1973. I suspect that when BCT ordered dual doorway buses the ‘agreement’ with the T&GWU was merely one of outline or agreement in principle to discuss the matter. It would appear that a detailed agreement with signatories was not secured until 1972. The initial conversions at the end of 1972 used single door Fleetlines, but evidently the T&GWU was prepared to allow two-door buses to be used on services to Leeds when these were converted in May 1973. The feeling I detected at Bradford was that neither management nor the T&GWU were keen to pursue OMO. Management believed that OMO made the service worse for passengers, while the T&GWU was against a reduction in potential members and staff – members – losing overtime. Just a reminder that the 5 Panthers transferred to Calderdale in early PTE days. There was a serious blind spot problem with the blank front corners and all were modified with small corner windows. Memory fails me but I wonder if a serious/fatal accident blamed on lack of visibility occurred. I recall that these weren’t bad buses, hadn’t done a lot of mileage with Bradford.The biggest problem was (the lack of) pit length and accessibility with 36′ long buses in the Dock Shop at Skircoat Road. They were also a bit limited on allocation because of road/junction/camber problems on many routes. Someone out there will remind me how long they ran in Halifax prior to sale to Chesterfield where they put in a good number of years service. 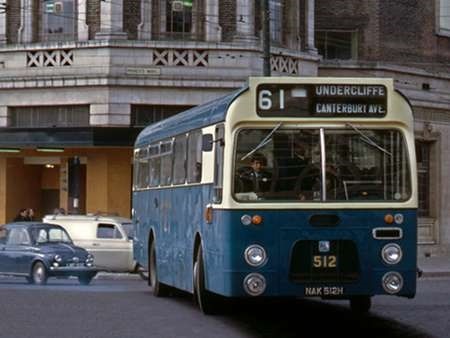 The first of the Bradford Panthers to arrive in Halifax was 2511 in October 1974, followed by 2508/10/12 in November and 2509 in December – all still in BCT blue and cream livery. They were allocated solely to the 5/6 West End Circular route, which required four vehicles during the daytime just going endlessly round and round, so presumably the fifth one was usually either parked up or ‘day in’ for maintenance. I don’t think the trade union would allow them to be used on any other route – I certainly don’t remember seeing them anywhere else. Unfortunately one of them was involved in a fatal accident when operating a 6 (clockwise) journey and turning right from Heath Road into Free School Lane – just a couple of hundred yards from Skircoat Garage. They had very thick front corner pillars which caused a terrible blind spot for the driver. The bus had begun to take the right turn and was not cutting the corner when a young chap on a moped approached from the right and appeared to stop at the junction with the intention of going straight ahead after the bus had turned. However he must have decided to chance it and accelerated across the front of the bus, but due to the blind spot the driver couldn’t see him and a terrible accident ensued in which the lad was killed. The bus driver was shown to have been blameless. The five were immediately taken off the road and, as Ian says, small (very small) windows were let into the pillars. My records only show that they were withdrawn during 1975, but that they passed to Chesterfield Corporation in the September. They ran them quite successfully until 1985/86 after which they saw even further service with CityBus in Manchester. That sounded a terrible, tragic accident indeed for all concerned John, and it still amazes me that in this day and age just how many modern cars have quite serious blindspots, especially to the rear. 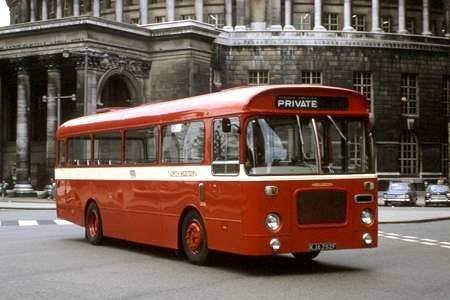 West Yorkshire had a 1964 Bristol RELH6G express coach (ERG1/1001: AWR 401B) refurbished by Willowbrook in 1977, which included a new peaked front dome, Duple-type windscreen and revised front dash panel, grille and headlamps. On return to West Yorkshire, and before re-entry into service, the Duple screen was removed and the original ECW ‘wrap around’ version reinstated. This was not connected with night-time reflections as is often stated, but due to a serious blind spot either side of the windscreen. 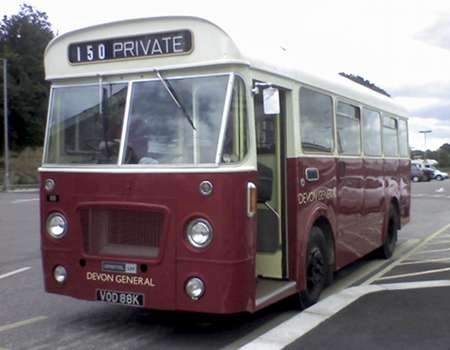 The Duple screen had curved sides, which on a Duple (or Plaxton) body would not have been a problem, as the body pillars/sides were also curved and therefore matched. The ECW body had straight pillars/sides, but the curved Duple screen was matched up to the front pillars using an infill panel at either side, which flared out towards the top. The local ‘Man from the Ministry’ would not pass the vehicle as he felt the blind spots were a serious hazard, hence the change back to original spec. We’ll never know, but the thoroughness of that Ministry Inspector may well have prevented a serious accident at some point, and even saved a life, for which we should be very thankful. The reference to the Panthers being used on the White Rose appeared in a recent book- though I couldn’t find the reference when I looked for it, inevitably. I moved to Sheffield in 1969 and used the X33 regularly but never saw or heard of Bradford actually working on the White Rose; more significantly no record of such a working ever appeared in local enthusiast publications of the time and I never heard fellow enthusiasts mention it.’Joint operation in South Yorkshire’, published by the Omnibus Society in 1974, is also silent on the issue, despite mentioning that, for instance, Ribble provided duplicates on Yorkshire Traction’s X19 (Manchester-Barnsley). It would be intersting if anyone can produce chapter and verse on Bradford’s involvement. There was mention somewhere to the effect that the Bradford share, based on the miles of the route in Bradford, was small, therefore Bradford saved up the miles which meant something strange like one bus every x weeks or similar. Will try and find the reference for you. Additionally, Brasford was able to provide breakdown cover for any buses having issues. Extracts from J S King (1995) Bradford Corporation Motorbuses pages 99 and 100. John King (RIP) is the acknowledged expert on all matters Bradford (trams, trolleys and buses). Mexborough & Swinton had proposed a network of routes along the then new M1. A consortium of interested parties was formed with M&S, Sheffield JOC, Rotherham, YWD, YTC, WR and Hebble and a service from Sheffield to Bradford via Dewsbury was agreed. On hearing of this Bradford applied and got consent but as the route in Bradford was less than 10% of the whole giving one journey a week, Bradford decided to accumulated mileage until there had enough for one bus for one week when they took over a YWD duty. Sheffield, Barnsley and Mexborough were to now appear on all future Bradford buses, meanwhile, 505 to 512 were made available and were occasionally used. A trial run by Bradford took place on the 14th October 1969 and service started four days later. Sorry about the delayed reply, but thanks to John Stringer for details of the fatal accident with one of the Panthers whilst in Halifax. It makes you wonder how they ever got through initial certification, I’m almost certain the blind spot would never have been accepted by the Yorkshire TA Certifying Officers. I recall a couple of Halifax Leopard/Weymann buses being ‘overhauled’ as an emergency measure by Willowbrook. They came back with new 6 year certificates (12/13 year old buses by this time) with far less work than we had to put in to obtain a grudging 5 years. This difference in standards in different Traffic Areas continued up to the day I retired!